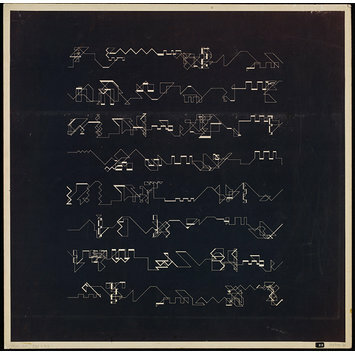 This photogravure, by Manfred Mohr (born 1938, Germany), is from a plotter drawing produced using a computer program written by the artist. A plotter is a mechanical device that holds a pen or brush and is linked to a computer that controls its movements. Pen plotter drawings can be very time consuming to produce. The artist transferred the image from the plotter drawing into a photogravure as this allowed him to produce multiple copies of the image, and was much quicker and more economical. 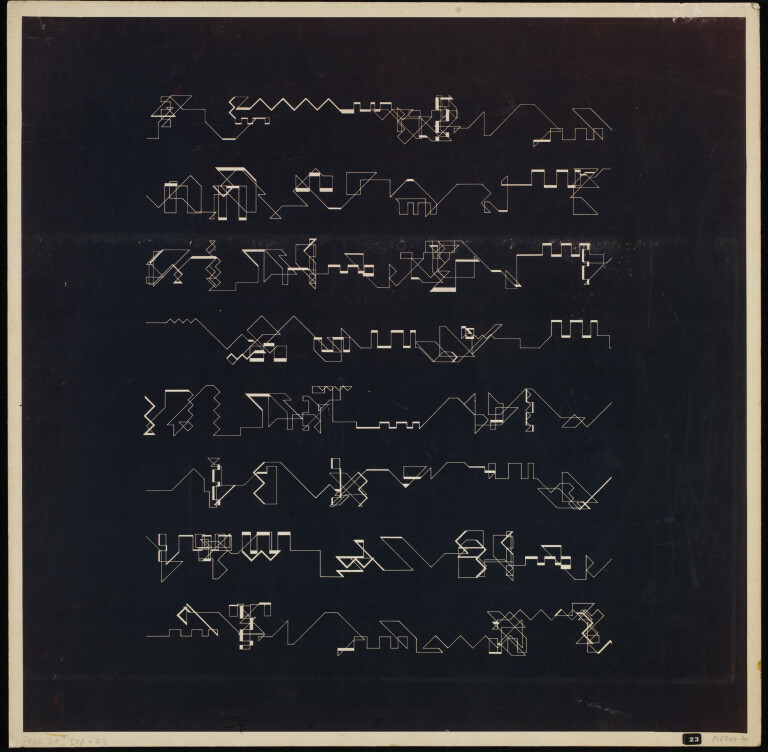 The artist created the photogravure by copying an image of the original plotter drawing onto unexposed film, which, through a photochemical process, created a 1:1 negative. This negative was then copied onto light sensitive paper by feeding it into a special copy machine. The computer program was based on a series of decision making processes that were used to structure the image. The artist deliberately wrote random variables into the process to allow the computer to make certain choices from a given number of options. Mohr would not be able to fully predict the appearance of an image until the plotter finished drawing. 'P-21' refers to the name of the program. Black and white photogravure on paper, from a plotter drawing. Mounted on board. In pencil, in lower left side. May be IR1? Artist's signature and date, in pencil, in lower right side. Black sticker with the number 23 on. Attached to lower right side. Possibly an exhibition reference number. 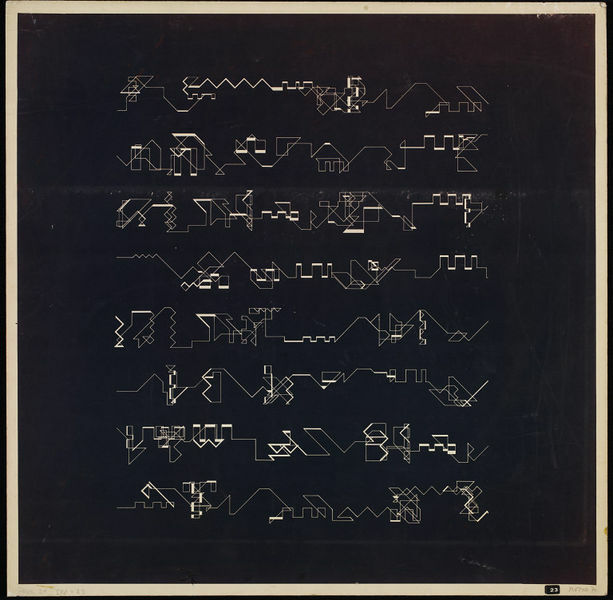 Photogravure from a plotter drawing, 'P-21 (band structure)', 1970, by Manfred Mohr. Herzogenrath, Wulf and Nierhoff-Wielk, Barbara, eds. Ex-Machina - Frühe Computergrafik bis 1979. Munich: Deutscher Kunstverlag, 2007. ISBN 978-3-422-06689-2. p. 419, ill.